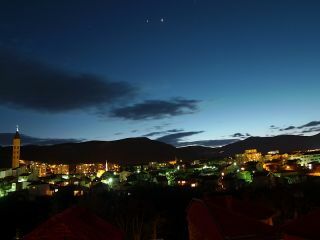 In this photo, snapped by skywatcher Tolga Bermek on March 12, 2012, Venus and Jupiter shine above the city of Mostar in Bosnia-Herzegovina. After creeping toward each other steadily for the last few months, Venus and Jupiter finally came together in what astronomers call a planetary conjunction Tuesday (March 13), putting on a spectacular show for skywatchers around the world. The two planets lit up the night sky in tandem, appearing so close together that observers could blot them both out with just a few fingers held at arm's length. And they provided a lasting display, blazing bright above the western horizon for hours at mid-northern latitudes. The celestial action Tuesday peaked when Jupiter and Venus lined up just 3 degrees apart in the night sky. (Your clenched fist held at arm's length measures about 10 degrees). Tonight (March 14), for example, they'll be separated by just 3.1 degrees. By Thursday (March 15), the gap between them will have extended to about 3.5 degrees. Somewhat confusingly, Jupiter and Venus also technically come into conjunction on Thursday, when they line up in another set of celestial coordinates (though they will appear farther apart then to observers on the ground than they did Tuesday). Venus-Jupiter conjunctions are fairly special events, occurring roughly every 13 months. This year's was especially stunning, experts say, because the two planets were visible for so long in the sky and appeared so bright. Skywatcher Shawn Malone captured this view of Venus and Jupiter from near Eagle Harbor, Mich. In the image, the bright planets are setting over Lake Superior. Though Jupiter is about 11 times wider than the roughly Earth-size Venus, Venus appears about eight times more luminous these days. That's because Venus is so much closer to us than Jupiter is. On average, Earth orbits 93 million miles (150 million kilometers) from the sun, a distance defined as 1 astronomical unit (AU). Venus zips around our star at about 0.72 AU, while Jupiter is found roughly 5.2 AU from the sun. So while the two planets appear close together in the night sky, in reality they're nowhere near each other. The orbits of Venus and Jupiter are separated by Earth, Mars and the main asteroid belt. Though Venus has now wrapped up its celestial dance with Jupiter, it will provide another skywatching treat in just a few months. On June 5, Venus will cross the face of the sun from Earth's perspective, appearing as a tiny black dot against the face of our star. Such Venus transits occur fewer than two times per century, on average. After June 5, the next one will take place in 2117.